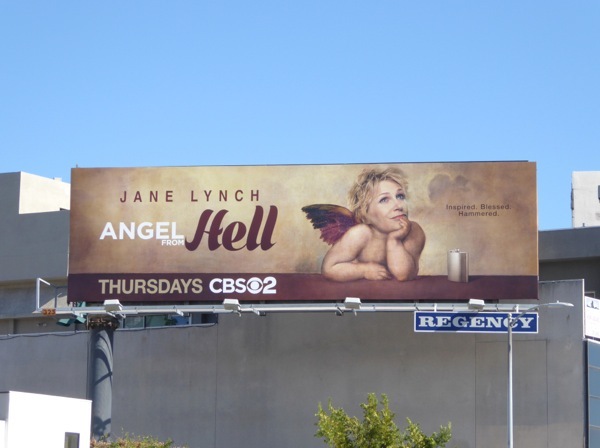 Jane Lynch has never looked so angelic as she does here in the series promo billboards for her new comedy, Angel from Hell. In the sitcom she plays an unorthodox guardian angel named 'Amy' who has been watching over a woman called 'Allison Fuller' (Maggie Lawson) since childhood, or is she really just a crazy lady stalking her? Nevertheless the two strike up an unlikely friendship. This ad creative is a parody of the cherubs from the famous Sistine Madonna painting by Italian artist Raphael Sanzio. It was only the other day that Daily Billboard also featured the Black Jesus season 2 billboard parody of The Last Supper painting and has also showcased The Ricky Gervais Show billboard parody of The Creation of Adam in the past. 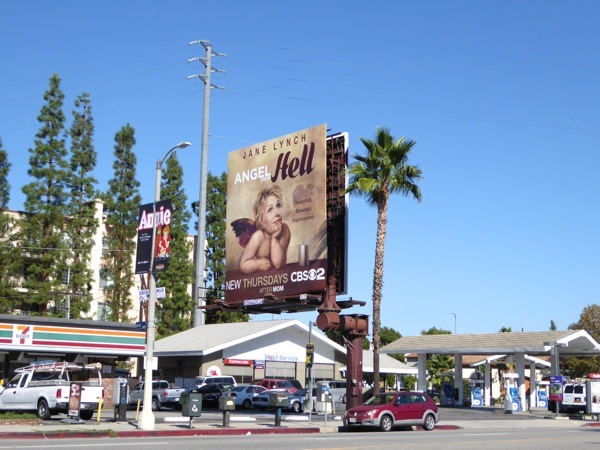 These series premiere billboards were spied along Westwood Boulevard on October 9 and along Ventura Boulevard in Studio City on October 11, 2015. If you're a fan of Jane Lynch, you can also check her out in these billboards for Glee and unveiling her Sue Sylvester waxwork at Madame Tussauds Hollywood in 2010. Originally planned to air November 5, 2015, it looks like the show will be a midseason replacement now debuting in February 2016. Will viewers be on cloud nine watching her new sitcom, or like her drunken character, will they be drowning their sorrows in dismay. We'll all have to wait a bit longer to see.